I went to see a show by a Japanese Manzai performer, Ms. Keiko Utsumi at Nikkei Heritage Center on Saturday, September 23rd. 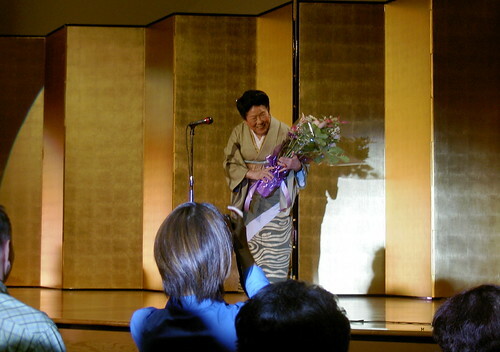 Manzai is performed by two people, but her partner, Ms. Yoshie Utsumi passed away about 10 years ago. So I was wondering how the show was going to be. Ms. Keiko Utsumi was born in 1922 and now she is 84. The show started, and I was blown away when I saw her coming to the the stage. She walked straight strongly and lively, and she stood up for the entire time. She looked great. I could understood why she has a 24 years younger husband. She started to talk about how she became a Manzai performer with lots of jokes. She read Dodoitsu like Haiku with playing Shamisen, and then, sang old Manzai songs. 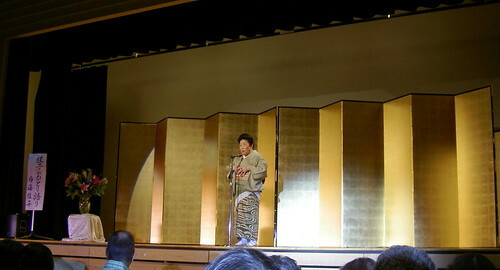 She performed Japanese traditional dance. It was so much fun and the time flew so quickly. The show was going to be one hour but she entertained us for 1 hour and 40 minutes. Apparently, she came to Vancouver since her friend in Vancouver asked her to. She performed without any money, and paid her own flight to come all the way. What an entertainer! I was very lucky to see her (Thanks for inviting me to the show, mum!). I want to live with fun and positve attitude like she does if I get to 84. This entry was posted in Art, Vancouver. Bookmark the permalink. Maybe you can entertain us this weekend with a story you heard from Ms. Utsumi. ☆Mrs. K., sure I will. She is a cool bird! but she is very sophisticated and of course funny.